People often wonder what it’s like to grow up in a military family. Unlike the TV show trope, my dad didn’t march us around the house, barking commands at my sister, mother, and me. After a long day of formations and the field, that was probably the last thing he wanted to do. Being in an army family means lots of things, but most significantly, it means moving around. A lot. My husband once commented that our daughter at 3 years old, had flown more often than he had the entire first 25 years of his life. I grew up around the army, and I was very outgoing…until it all slammed to a halt in about 5th grade. I remember it distinctly, because that was when all the social awkwardness happened, and the things I loved (like drawing, reading, bugs, and sci-fi) suddenly became “weird” to the people that had so recently played side by side with me. Being a military family meant that just as social awkwardness set in, we got into an unfortunate pattern of moving nearly EVERY YEAR. So just as I was settling in somewhere, it was just about time to pick up & move. I became a bit more introverted. I stuck my head in my sketchbook and didn’t bother to get to know anyone. Boohoohoo. Believe me, it’s not a story of pity. My parents took us to so many wonderful places and we did so many fun things. I’ve seen amazing and wonderful parts of the world that my heart STILL aches for. Yes, school was rough at times, but isn’t it always? I lost & found my voice many times, and I’d be a completely different person if anything in it had changed. Years later, I JOINED the army, and found my voice again. I spent four years in that were some of the most important years in my life. Now I’m married to a soldier, and we have our own “army brat” (that’s VERY loving term of endearment and respect, for non-military folks who may be unfamiliar with the term). But one of the down sides of moving around so much is that we either hang on to things too much, or we let go of things too easily. Maybe that’s also true metaphorically, but I’m talking in this case about actual THINGS. I’ve had friends who spoke of family heirlooms and things being passed down from generation to generation–an idea that fascinated me when I was younger, as we didn’t really have that sort of thing. Moving a lot means the army gives you only so much weight allowance, so sometimes you have to dump the excess. When I was around eight, I got a Steiff donkey (Steiff is a German dollmaking company). I was in LOVE with that donkey. My sister got a teddy she called Molly Bear. I tried to name my donkey, but he always ended up Just Donkey. He was my go-to guy. I cried many tears into his furry gray neck, and I cuddled with him on many happy nights for many many MANY years. 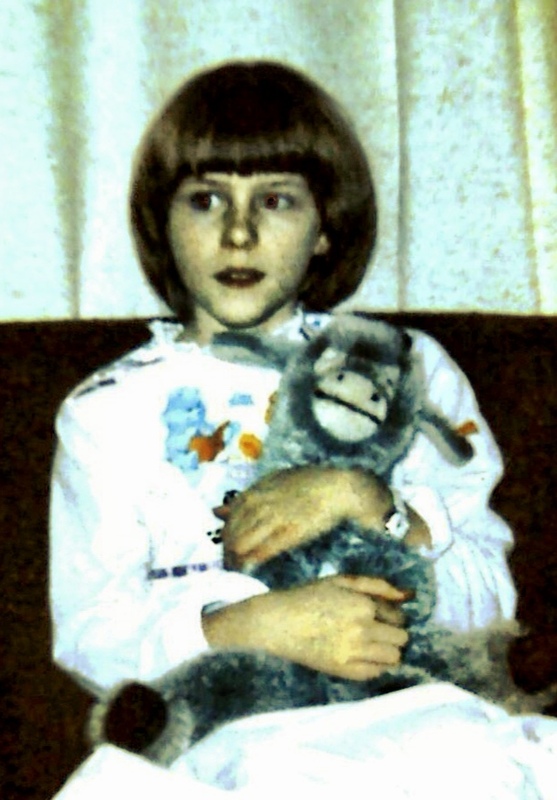 Me in my Care Bears jammies with my Prince Valiant ‘do, and a brand new Donkey. Several MORE years later, not long after Myla was born, I asked again about Donkey. Sadly, it was discovered that most of the dolls and boxes in the shed had suffered at the hands of a major mouse infestation. Dolls and clothing had been shredded by them, paper and stuffing used to make nests in what was once assumed to be sealed-tight containers. Quite a few things were lost or destroyed by mouse-droppings and nibbles. It was a mousetastrophy. I had heard (for a military family, especially) that it helps comfort a kid to have a doll that is a special “lovvie;” the one constant thing that your kid can connect with and keep, and with a new (and VERY fussy baby), I would have loved for that to have worked. I am here to tell you, my friends, that in my experience, you cannot MAKE a doll be a lovvie. I tried to make many dolls and blankets her lovvie, and nothing stuck. I constantly put them by her in bed, I’d give one to her when she’d cry, and she could really not care less if they were there or not. And then, just before Myla’s first birthday, mom sent a package to us in Alaska. It was my DONKEY!! And he was FINE! He had somehow survived the rodent apocalypse unscathed! Mom had washed him and sent him to us when they cleaned out their shed. 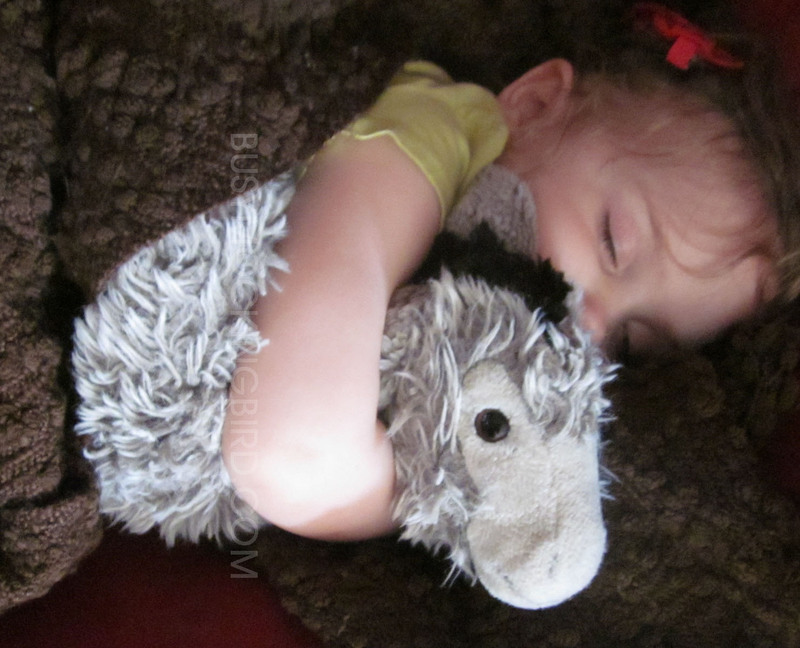 I happily gave my beloved Donkey to Myla, who I assumed would simply cuddle him for a bit and toss him aside. But for some reason, out of ALL the dolls that have ever come and gone, THIS one stuck. From the minute I gave him to her, he has rarely left her side. So Donkey has been with her since before she could walk, and though other dolls have come and gone, she always goes back to Donkey. New dolls are the occasional favorites sometimes (I may have mentioned she has a stuffed animal addiction), but she always goes back to Donkey. 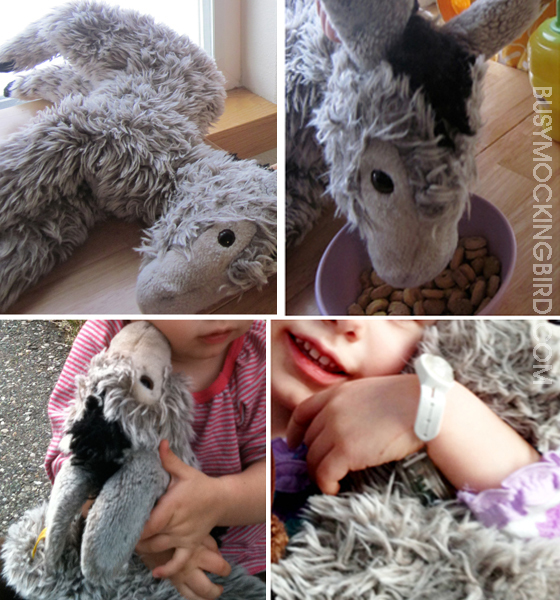 Donkey has been there for doctor’s appointments, shots, airplane rides, hotel nights, and was a MUST the time she had to stay overnight at the hospital after a bad flu. He has been puked on, accidentally painted on, and had food and drinks spilled on him. His fur, once fluffy and soft, is now matted and course. His neck flops from years of constant cuddling. His mane and tail are nearly threadbare. He is hers, and she loves him. I can’t change the fact that we move so much, and as an army brat myself, I think it actually ends up making you strong. You appreciate what you have, and enjoy the people around you. You have friends from all over, and even when it’s hard to keep in touch, you can be miles apart, and still feel close to them if you’ve been lucky enough to find some good ones. So in her world, it makes me feel good that something so loved in my life has been so well-loved in hers. So do you or your kids have a special doll? Some sort of “lovvie” they can’t part with? Do you have something special you’ve passed down to someone else? My donkey was Eeyore. He was made from scraps of a wool dress my Grandma made for herself from a set of patterns of the Winnie the Pooh characters my mom sent off for. He was loved and patched and parched again. Wow, Donkey looks so proud in Myla’s arms in that pick. He is looking at the camera like he’s so proud to keep her safe and sound asleep. I have a stuffed bunny that plays the lullaby song like a music box that I’m saving to hopefully pass down in the future. And I must confess I still have a stuffed Winnie Pooh that is so comfortably squishy to hug when I sleep. Pooh also gives support to my neck when I read in bed. Pooh has been through all, like a Tonka truck, but just put him in the washer and dryer and he’s as good as new. I had Bunny…he’s in the wardrobe right now. I patched his trousers so many times, remember asking my mum not to hurt him when she had to sew an arm back on, and only the very insides of his ears are pink now. But I wouldn’t ever part with him. My daughter – not fussed with cuddlies, but she still has the rainbow square blanket I knitted in bed with her. I have a beloved Raggedy Ann and I so wanted her to be my daughter’s lovie but like you said, you can’t MAKE a doll or stuffie be a lovie… it just happens. Raggedy Ann has just a few sprigs of red yarn left on her head and the stitches barely hold her fabric closed enough to keep the stuffing in on her hands and feet. Her 44-year-old face is darkened and threadbare. But she does have an honored spot on my daughter’s shelf who knows how much that beat up doll means to me. My daughter has Kee Kee who has traveled innumerable places in her almost nine years. She is actually “new” Kee Kee. My mother-in-law in her infinite wisdom (not sarcasm) thought to purchase a back-up Kee Kee when she noticed that small pink blanket kitty never left my daughter’s side. The original Kee Kee was a baby shower gift and was named by my daughter… one of her first words. Kee Kee soothed at doctor’s visits, had unplanned sleepovers at preschool, and slept almost every night clenched in my daughter’s tiny fist, draped over her cheek while she fell asleep sucking her thumb. Alas, after a day of errands with me when my daughter was around 4 years old, the original Kee Kee (“old” Kee Kee) was missing. I dried so many tears and made so many phone calls and trips around the stores and parking lots we had visited that day to no avail. Thank goodness (and grandmother) for the back up… but would it “take”? Slowly, “new” Kee Kee managed to fill the gap and she has now become “old” Kee Kee though occasionally my daughter will still ask me about the day when we lost the original Kee Kee. And she will imagine great things have happened to her in what she chooses to believe is her new home… of course with a loving little girl taking her on great adventures. I had “Hubber,” a strange egg-creature that was supposed to be Humpty Dumpty. When my daughter was born, I found a cute HD illustration on Etsy and sat Hubber on a shelf by it. From time to time, my daughter demands that I take Hubber down, where he joins her in bed and during tea parties for several days. Makes me happy. What a great story! We took our children to the Steiff museum in Germany last year, it is lovely to see the history of their animals and all the hand work and care that goes into manufacturing the stuffed toys. I had a little green bunny that came in a basket of flowers on the day I was born. He used to make cute sounds when you shook him, but he’s much quieter these days. He’s seen me through all the usual growing pains, and has seen the coming and going of 3 real-life bunnies. Just discovered your blog, I love the collaborations you’ve done with your little one; and this post almost makes me feel you’re perhaps a kindred spirit. That very Donkey is my little’s fav, she goes everywhere, and her name is Molly. My grandmother sent Molly to her after I failed at finding her a “lovie”, bonding with Molly took absolutely no time at all. Molly is from my mom’s childhood as a Navy brat. Anyway, thanks for sharing, you have no idea how surprised I was too see another donkey just like Molly as I was scrolling through your page. Keep up the awesome work! I love how unique your work is and your ability to share projects with your little one. That story is so sweet. You can’t tell, but I’m near tears. And yes. I have a lovie. It’s an eight inch long tagless beanie babie. His name is Old Pal, I got him in third grade, just finished fifth, and that thing has not left my side for a minute.